The man of the moment is Narendra Modi. Whether one agrees with his political leanings or not, no one can deny that the man who now occupies India’s highest electoral seat has, in a historic election, ushered in a sweeping change at the centre. Seen as a knight come to the rescue of a nation, he is the man who will now spearhead the country’s fate in the years to come. Modi rose above his birth and with his own drive and focus crafted his own destiny. For though he hails from a humble grocers’ family in Gujarat, from his tender years he walked to a different drummer. He showed a fascination for sadhus, meditation and worship even when he was a child. It has been reported that aer completing his school education, he ran away from his home, and travelling through many places, he reached the Himalayas and lived there for a while with unknown, but yogic, sadhus. He returned home and ran a tea stall with his brother, selling tea for many years. The lessons he learnt in these hard years helped shape his focus and approach to life. 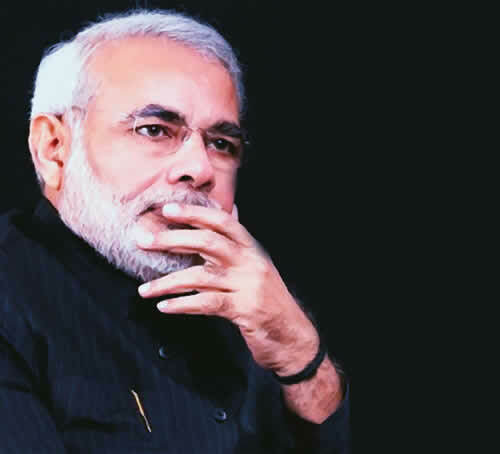 Modi’s charisma and oratorical skills hold your attention. And if our first Prime Minister Pandit Jawaharlal Nehru turned into a sartorial icon with his effortless elegance and confident simplicity, his bandhgala jacket, the Nehru topi, and the red rose, the man of the moment has his own way of dressing. In the public eye, Modi is always impeccably groomed in well-ironed clothes that rarely seem to sport a wrinkle. His characteristic way of dressing is a half-sleeved kurta, sometimes teamed with a Nehru jacket, and a fitted-pyjama – a desi, eye-catching ensemble. His favourite clothing outlet used to be Jade Blue in Ahmedabad. His beard and hair are trimmed well, ensuring that overall he exudes an aura of elegance, commanding attention whenever he moves about. He is undoubtedly the man who has changed the face of Gujarat. Today, India and the world wait and watch as he takes over the new reigns of governance.